Wow, this was an incredibly anti-climactic draft. I'm not exactly sure what I expected to happen, but it didn't. No trades, no drama, no nothing. 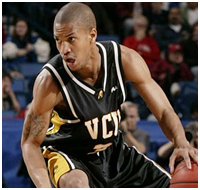 The Jazz took Eric Maynor from VCU with the 20th pick. Chances are he'll spend most of the year in Orem with the Flash. How exciting. 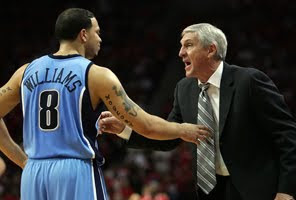 Maynor may end up being a great pick. I was just disappointed the Jazz passed on Sam Young. Then again so did a lot of teams, so maybe they know something I don't? Young just seemed like the exact kind of player the Jazz needed coming off the bench. I viewed him as the perfect replacement for Harpring, who may have played his last NBA game. He's a tough guy, and the Jazz could sure use a few more of those. I'm still dumbfounded by the Suton selection in the second round. I'll be shocked if he ever sees a minute on the floor for the Jazz. I was hoping they would take Nando de Colo, whom the Spurs selected three picks later. Considering the Spurs are ususally smarter than every other team when it comes to the draft, he'll probably end up being a star. Now we wait a few days to see what Boozer, Okur, and Korver do with their contract options. I predict Kyle and Memo will opt in, and Boozer will opt out to sign with the Pistons.